Washburn Style 5310 Model Carved Top Mandocello, made by Lyon & Healy, c. 1925, made in Chicago, serial # 1775, natural lacquer finish, maple back and sides, spruce top; laminated mahogany neck with ebony fingerboard, original black hard shell case. 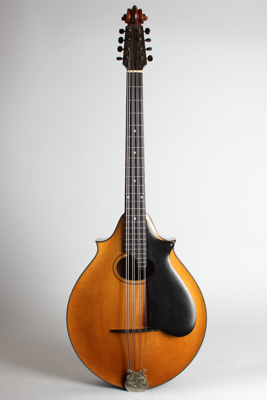 This Washburn Mandocello is one of the elaborate and beautifully made mandolin family instruments that Lyon & Healy introduced in 1917 -- the only really serious competition Gibson ever faced in the high-end carved-top 8-string market. The Chicago company launched this line with a blaze of publicity and claims of superiority, likely very troubled that their dominance of the bowl-back mandolin market had been rendered moot by the overwhelming success of the newer carved-top Gibsons. The L & H carved-top mandolins were fairly successful and continued to be built (both under that brand and subsequently "Washburn") well into the Depression years, but the larger sister instruments (Mandola and Mandocello) were made in very small numbers are now exceedingly rare. Determined to outdo Gibson at their own game, Lyon & Healy created a timelessly elegant classic in the original Style A using the finest possible materials and a thoroughly original design. Some consider this model the finest mandocello ever designed, superior to the scroll-topped Gibson K-4 and even to Lloyd Loar's 1923 guitar-bodied K-5 Master model. The Washburn's elaborately carved violin scroll headstock is immediately distinctive, but the flame maple 2-point body, shaped black fiber pickguard, antique shaded violin-style finish, and fancy tailpiece cover are all signature features. The sound of these instruments is very refined, more delicate and lighter than most Gibsons, with a nicely rounded tone and less "bark". They have been considered since the 1910s to be the best instruments ever made for classical mandolin orchestra playing, but of course that pastime has been declining since the Harding administration. This is a very late example of the Style A mandocello, by now re-christened the Style 5310 and branded as "Washburn", but essentially the same instrument. It appears to date around 1925-6, by which point the mandolin family was in steep popular decline. Be that as it may, we are always impressed by both the sound and craftsmanship of the Lyon & Healy Style A mandolin family, and this top of the line mandocello is both an exceptionally rare and extremely fine instrument worthy of any player's or collector's attention. Overall length is 40 in. (101.6 cm. ), 14 1/2 in. (36.8 cm.) across at the widest point, and 3 1/16 in. (7.8 cm.) in depth, measured at side of rim. Scale length is 25 7/8 in. (657 mm.). Width of nut is 1 5/8 in. (41 mm.). This instrument remains in splendid and complete original condition, with just some very light general wear. There are some tiny dings and dents, but no major finish wear or signs of damage. Oft-missing pieces like the large fibre pickguard and elaborate pictoral tailpiece cover are present and accounted for. It plays very well, set up with the approved Thomastik-Infeld flatwound classical strings for the traditional orchestra style sound; tonally it is really close to a plucked 'cello, as intended. This is as fine an example of this extremely rare instrument as we have ever seen, and it is housed in the ONLY original hardshell case for a Lyon & Healy mandocello we have ever encountered! Excellent Condition.